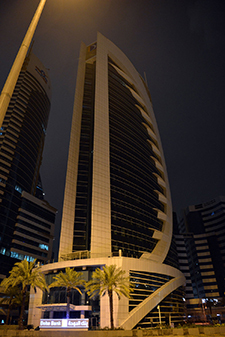 Reinforcing its commitment to climate change action, Doha Bank, one of the largest commercial banks in the State of Qatar, showed its support for the annual Earth Hour global initiative by switching off the lights in its corporate headquarters in West Bay and various branches across Qatar for one hour on Saturday, 24 March, from 8.30pm until 9.30pm, local time. “Doha Bank is known as one of the most active advocates of Corporate Social Responsibility (CSR), owing to the numerous green initiatives that we organize and support including the Al Dana Green Run, ‘ECO-School Programme’, and beach cleaning and tree planting initiatives amongst others. Climate change is a real challenge for the modern world, and organizations have an important responsibility at hand to support the change towards a low-carbon emission future,” said Dr. R. Seetharaman, CEO of Doha Bank. “As every year, we are proud to support the global Earth Hour initiative and raise awareness about energy conservation while continuing to support and advocate our green policies across all areas of our organization and encouraging our teams to “Reduce, Reuse & Recycle” to minimize resource utilization and contribute to the efforts of saving our planet” he added. Doha Bank’s pioneering work in raising environmental awareness has been recognized over the years through a series of awards and accolades, including the ‘Best Green Bank 2008 at the Industry Awards’ from Bankers Middle East, and the ‘Golden Peacock Global Award for Sustainability’ in 2010, 2011, 2013, 2014 and 2017.